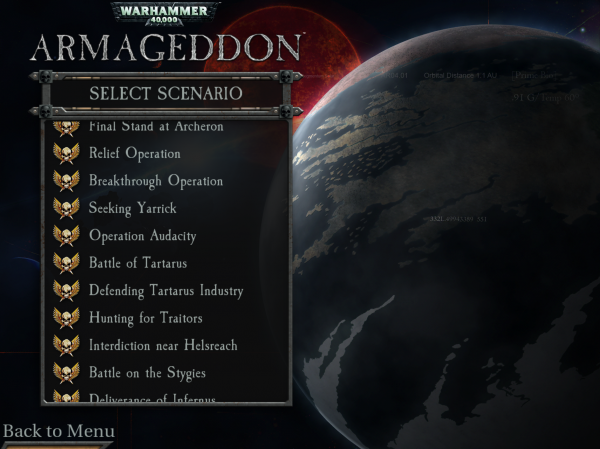 Warhammer 40,000: Armageddon is a super deep strategy game that can be quite a lot to take in. Here's how to make sure you're combat ready when playing. There's no shortage of Warhammer 40K games on the App Store, but not many of them deviate from the strategy genre. Pixel Toys seems to want to address this with Warhammer 40,000: Freeblade, where you play as an Imperial Knight (i.e. a giant chainsaw-armed mech). Works for me! 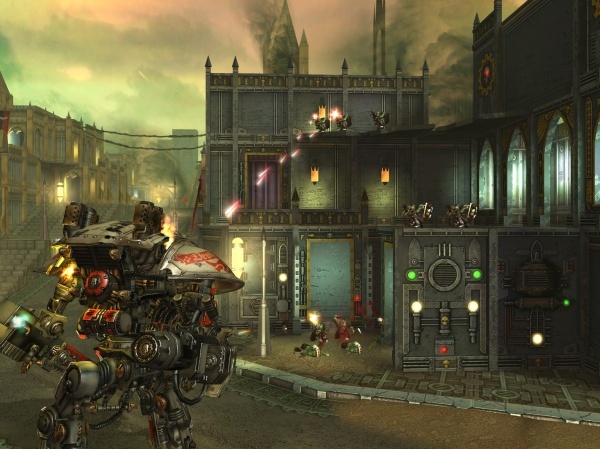 Warhammer 40K: Armageddon is complex, robust, and not for everyone. Our rating: :: SUPER BATTLE BROS.
Blah, blah, blah, Rodeo Games one-upped themselves again, blah, blah. Rodeo Games has announced a new upcoming title from the Warhammer 40,000 Universe - Deathwatch: Tyranid Invasion. You'll be the commander of a squad of Space Marines as they battle against the Tyranids in 40 campaign missions. The game will utilize Unreal Engine 4, along RPG gameplay to let you customize your Space Marines like crazy. You can also go up against your friends in online multiplayer battles. "We were thrilled when Rodeo chose Unreal Engine 4 for Deathwatch," said Mike Gamble, European Territory Manager for Epic Games, in a press release. "These guys have amply illustrated our belief that UE4 is an excellent choice for building high-quality mobile games that really stand apart from the crowd." Deathwatch: Tyranid Invasion will be out this summer. Despite its looks, this Warhammer 40k strategy game is about as graceful and elegant as the bulky space marines being portrayed. HeroCraft has announced that Warhammer 40,000: Space Wolf, a turn-based strategy set in the Warhammer 40k Universe, will launch on iOS later this week. 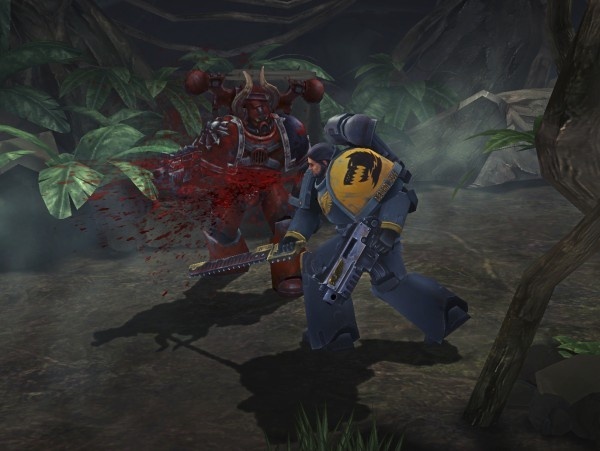 The game is set to feature a single player campaign against Word Bearers and other enemies of the Space Wolves, with different heroes available to select for different play styles. Players will be able to unlock perks for each class and companions, two of which can be taken into each battle. The game also features a collectible card game element, with victories unlocking bonuses, tactics cards, and new weapons. Warhammer 40,000: Space Wolf will make its way to the App Store on Tuesday, October 28, and will be free to download. Do you like Warhammer? Are you looking forward to, or even just curious about, the upcoming Space Wolf mobile game from Herocraft? Then you should head on over to AppSpy because they're going to be giving away codes for both the game itself and free booster packs as they stream everything on Twitch in a couple of hours. Or, you know, you could hang out here and watch the stream down below. That works, too. The fun will start at 9am PDT, 12pm EST, 5pm BST. Watch, have fun, maybe get a free prerelease game out of it. What's not to like? Warhammer 40,000: Carnage, by Roadhouse Games, has gone on sale for 70% off. The wildly popular game was recently ranked #1 in Role-Playing in the UK with its RPG side-scrolling action. It's only on sale for a limited time, so if you want to nabWarhammer 40,000: Carnage for $1.99 (down from the usual $6.99) you'd better hurry. Coming soon to iOS will be an all-new Warhammer 40,000 tactical strategy game by the name of The Horus Heresy: Drop Assault. The first ever game to be set in the Horus Heresy, The Horus Heresy: Drop Assault will be a fast-paced strategy game in which players choose to be either a Traitor or Loyalist as they challenge their rivals around the world. The game promises there will be plenty of base building, which probably means it will be a Clash of Clans kind of game. While a release date hasn't been announced yet, we do have a teaser trailer to suitably, well, tease you about it. As soon as we know more about The Horus Heresy: Drop Assault, we'll let you know. You can't keep a Dark Angel down. The new Dark Angels Chapter Pack for Warhammer 40,000: Carnage from Roadhouse Interactive, has players taking on the role of the Dark Angel Space Marine on his path to reap revenge after being captured, beaten, and left to die in a ruined temple. The new chapter comes with a lot of exciting additions. Players can equip the Plasma Gun and fight their way through Arena Combat gameplay featured in the new missions. Roadhouse Interactive has also included Wargear Supply Caches in which players can find the most powerful Wargear on Mithra. The supply Caches can be bought using gold or found on missions. 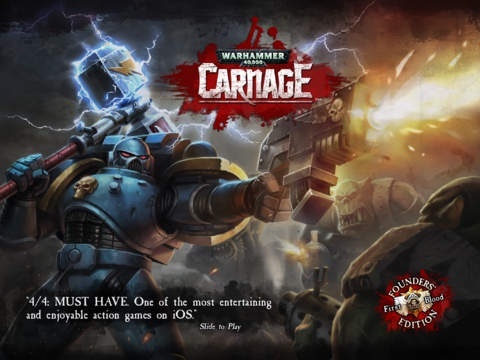 You can buy Warhammer 40,000: Carnage on the app store for $6.99. Once you have it, the Dark Angel Chapter Pack can be unlocked for gold in game. Warhammer 40,000: Carnage is a very straightforward action game that knows it, and maximizes the strengths it has. Many problems from the PC version persist, but Space Hulk is still an entertaining strategy game. HeroCraft has released an announcement trailer for their upcoming turn-based card collecting game, Warhammer 40,000: Space Wolf. Players will build their own decks and lead their squad into tactical combat by using the cards they collect. This free-to-play title is expected to be released sometime around Q2 of 2014. Warhammer 40K has been around for years, but its recent spike in popularity has been great for introducing new players (and entirely new generations) to real Space Marines. And the licensing continues with Herocraft and Games Workshop's upcoming free-to-play iOS title Warhammer 40,000: Space Wolf. Space Wolf will be a combination of turn-based tactical combat and card collecting. Moves, weapons, and pretty much everything else is handled via cards while the action plays out in 3D. More powerful cards can be acquired through victory (glorious victory! ), upgraded through the Iron Priest's Forge, and presumably purchased with various forms of currency. Follow the path of the Grey Hunter, Wolf Scout, Blood Claw, or Wolf Guard as you face-off against Word Bearers and Necrons in what is being described as "An epic campaign with branching storylines, spanning hostile environments on a far distant planet." Personally, I can't freaking wait. Space Wolf will be coming to iOS (and Android and PC) sometime in 2014.